The intersection between climate change and transportation will be on full display during a committee hearing in the U.S. House of Representatives. But will members of Congress take the opportunity to examine the critical role that federal transportation policy has played in creating the climate crisis? Here are six things we’ll be looking for during the hearing. Beth Osborne, senior policy advisor for T4America, sat for an interview on one of the best-named podcasts around — The CodCast — to talk about the uncertainty of just what transportation means in the Trump administration. Two days after the election, we streamed a live post-election panel discussion on how the 2016 elections will impact transportation policy at the federal, state and local levels. If you missed it, catch up here. What should the next administration do when it comes to transportation? One of the biggest challenges for the incoming presidential administration is to make the economy work for individuals and families of all income levels. This short new guide of federal policy recommendations is designed to help the new administration accomplish just that. We’re only three weeks away from the expiration of MAP-21, the transportation law of the land, and Congress still does not have a solid plan for renewing or extending it — or for keeping the nation’s transportation fund solvent past the first days of summer. Understanding how current federal transportation policy works — much less how to go about changing the current system — requires a sometimes painful amount of context. 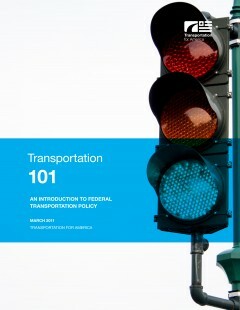 So we put together this comprehensive report to provide some clarity and document where we’ve been, how the program works (or doesn’t work) the process of reauthorization and the new (and old) challenges facing us tomorrow and beyond as Congress debates a new transportation bill.